So please keep in mind I did not draw these. I simply translated them. If you have any brief fan comic/picture requests, or are feeling kind enough to donate, please use the “DONATE” button on the top right of this page! Original comic and w_spead’s gallery here. 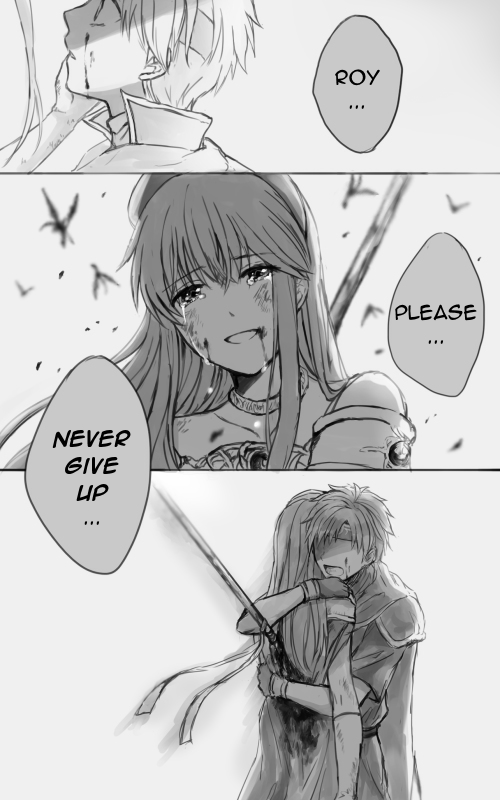 The fan translation for the game lists it simply as “Roy, do not lose.” This is accurate, but when considering the rather dramatic angles and depiction here, I took the literal meaning and expanded upon it a bit. For one the “どうか ” can be simply translated as “please” or as “someway or another.” Ideally, one would use it as “no matter what” (so you must not lose, or do not lose no matter what). The next part is 負けないで, which is literally “do not lose/give up/surrender.” So you can see how the fan translation got to where they did fine. But I decided to go with “please” as the sort of final request style, as “you must not lose no matter what” may become a bit of a mouthful for someone who is saying their last words. You’ll be surprised how much thought is actually put into even little comics like this! That’s how it goes, though! There are a few other comics in their gallery I may take a look at, but for now this is it! 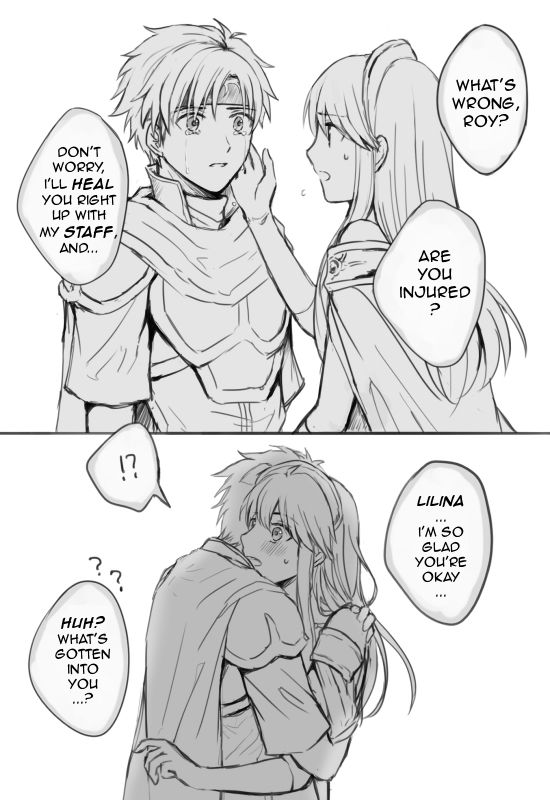 This entry was posted in Fire Emblem, Manga, Translation, Video Games and tagged 3ds, doujinshi, english, fan comic, fan manga, fe6, intelligent systems, japanese, lilina, nintendo, pixiv, request, roy. Bookmark the permalink.